Family found: Jan’s cousin Simone and husband, Niek, visited Seattle in August. Jan had not seen Simone in at least 25 years! They had taken an Alaskan cruise and then stayed with us for a few days after their cruise ship arrived back in Seattle. Training marathoners, they enjoyed running the Sammamish Trail from Bothell to Redmond (10 miles). Jan and Sofia also took them on a sunny ferry ride to Bremerton. We really enjoyed their company and hope we can visit them some day! Gorgeous Gorge: In search of sun and warmth this weather-crazy summer, we took our annual RV trek to the Columbia River Gorge in Oregon. Visiting the Gorge was a last-minute selection after weather reports indicated that our first choice, the Oregon Coast, was going to be cool and damp, but we didn't regret the change. We found lots of sun and fun. After a night with the Williamsons in Portland, we spent two nights at Deschutes River State Park, near The Dalles. It was a beautiful park, and we spent time nearby at the worthwhile Columbia Gorge Discovery Center and Museum and viewing Native American pictographs and petroglyphs at Horsethief Lake State Park just across the Columbia River Bridge in Washington. The next two nights we spent farther west at a KOA in Cascade Locks. From there we visited the extensive Bonneville Lock and Dam visitor center, and Cameron and Amy cruised the Columbia on a genuine sternwheeler. (Sofia's favorite activity there was the KOA's swimming pool!) Our last night was spent in Washington at Silver Lake Motel and Resort. "Resort" is quite an overstatement, but we did have fun renting a pontoon boat on our last day and circling the beautiful Silver Lake. 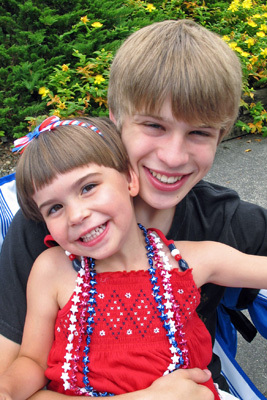 Festive Fourth: For the 4th of July, we watched the Bothell community parade. Sofia's favorite part of the parade was the candy that participants threw to onlookers; Cameron liked the classic cars. Then we went to the Richards' house for games, barbecue, and early fireworks. Sofia loved the inflatable bouncing cage they had rented for the day. Cameron and friends played basketball, badminton, and bongo balls. When the time came for the kiddie fireworks at dusk, Sofia covered her ears, but she wasn't frightened by them like last year. Cameron, as always, took joy in all pyrotechnics, the larger the better. 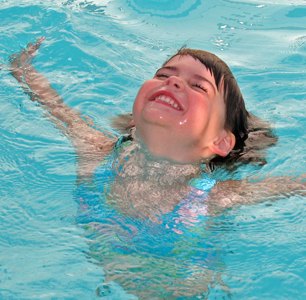 Little fish: Sofia is taking swim lessons all summer long. She adores the pool and has quickly progressed to swimming across the pool without any floaties! Father's Day: We had beautiful weather for Father's Day this year. We spent the afternoon at Waverly Beach in Kirkland, playing on the beach, relaxing in the grass, and eating a picnic dinner. Freedom at last! 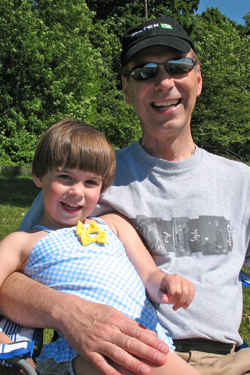 : Both Sofia and Cameron ended their '07-'08 school years with a sunny half-day on Wednesday, June 18th. For Sofia, it was pretty much a normal day; after all, what is preschool but fun work, anyway? She'll be back to the same classroom and teachers in September, although full-time rather than half-time. For Cameron, however, the day was a long-anticipated release. After working very hard to keep his sophomore grades up (with six A's and one B+, he has a semester GPA of 3.9), he's ready for a summer of greater freedom now that he can drive. Of course, he needs to find a summer job so he can pay for the gasoline—but he wasn't thinking about that on the last day of school.